From my discussions with people within the construction industry, there appears to be some resistance to adopting circular economy principles on construction projects. This could be because they do not understand the principles of the circular economy, or they believe it is too difficult to achieve, both of which are understandable as this is a new concept. From my experience in helping the Waste and Resources Action Programme (WRAP) in trying to get designers to design out waste, it was very much seen as another thing to do, and time is money. There never seemed to be enough money in the design fee to take the time to look at designing out waste, or making the construction more resource efficient. We therefore need to make it easy for Designers to choose more circular products or building methods for the concept to be adopted. The perception is that circular products are not readily available; however there are already a number of solutions out there. We have already discussed the Philips Lighting pay-per-lux model used at the National Union of Students Building in London, but there are others. By their nature, ceiling and carpet tiles are relocatable if the right fixing systems are specified (e.g. grip pads rather than glue for carpet tiles). This could be within the same building, or through donation to a reuse scheme (e.g. Recipro). Manufacturers such as Armstrong Ceilings will also take back ceiling tiles at the end of their useful life, and these are then used to manufacture new tiles. Major carpet manufacturers such as Desso, Interface and Shaw also have take-back services, as do the vinyl floor manufacturers through their Recofloor scheme, and some will also offer a maintenance contract to look after the flooring. For longer life products, such as internal partitions, there are also solutions. Plasterboard partitions cannot easily be relocated using the current construction methods, and although the major plasterboard manufacturers will take back offcuts from construction, they are reluctant to take back demolition material. There are however alternatives such as the relocatable systems provided by manufacturers such as Komfort. These relocatable systems can be used and moved within the same building over and over. If ceiling heights are standard (usually 3.000m for an office) they could also be relocated to other buildings. Mechanical and electrical equipment are great candidates for service contracts, however there are few manufacturers offering these at the moment in the same way as Philips. Cassette Boiler is one of the few, and they have designed a boiler that is installed in two parts – a permanent back plate that has all the pipework connections, and then a removable boiler cassette (see below). The boiler cassette can be removed in a couple of minutes for maintenance, or completely removed and sent back to the factory for major repair and refurbishment, with a new cassette installed in its place straight away. This type of model can also reduce obsolescence as upgraded parts can be fitted to the refurbished cassette. We are not just talking about newly designed materials either. 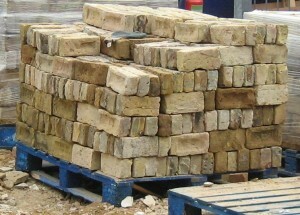 The humble brick is one of the ultimate CE materials, if it is laid in the right mortar. Laying bricks in sand and cement mortar means they cannot easily be cleaned for reuse. However if they are laid in sand lime mortar, this can be easily cleaned off so the bricks can be reused at the end of the building’s, or cladding’s, service life. Another advantage is that movement joints are not required, meaning there is an unbroken elevation. Newer versions of ‘brick cladding’, such as terracotta rain screen cladding could also be recovered and reused indefinitely if detailed correctly. This is just a small selection of what is already out there. What we now need is more product manufacturers looking at circular economy solutions, such as fixings that allow their products to be disassembled and reused at the end of a buildings life. And once they have solutions, we need to promote these to the design community so they become the go to product for a particular application. If you would like us to help you move towards a more circular business model, or would like to let us know about a circular product, please Contact Us.